When it comes to getting potential members into a credit union’s branches, there’s no better place to start than local search. To ensure branches attract new members, it’s important they rank as highly as possible in local search results. 92% of consumers use local search to start evaluating where to take their business. 98% of searchers pick a business that is on the first page of the search results. The top five results on search engine results pages receive 67.6% of the clicks. There isn’t a standard definition, but think of it as anytime someone searches online for something that exists within their geographic area. For example, when a potential member types “free checking” into the search bar, they receive a listing of nearby financial institutions and usually a map to go with those results. To ensure your branches top the local search results — thereby increasing the chance potential members will find you — start by executing the four tips below. Google My Business is a tool Google created for businesses to manage their online presence across Google Search and Maps. For example, Google My Business listings populate Google results when users search for nearby restaurants or stores. 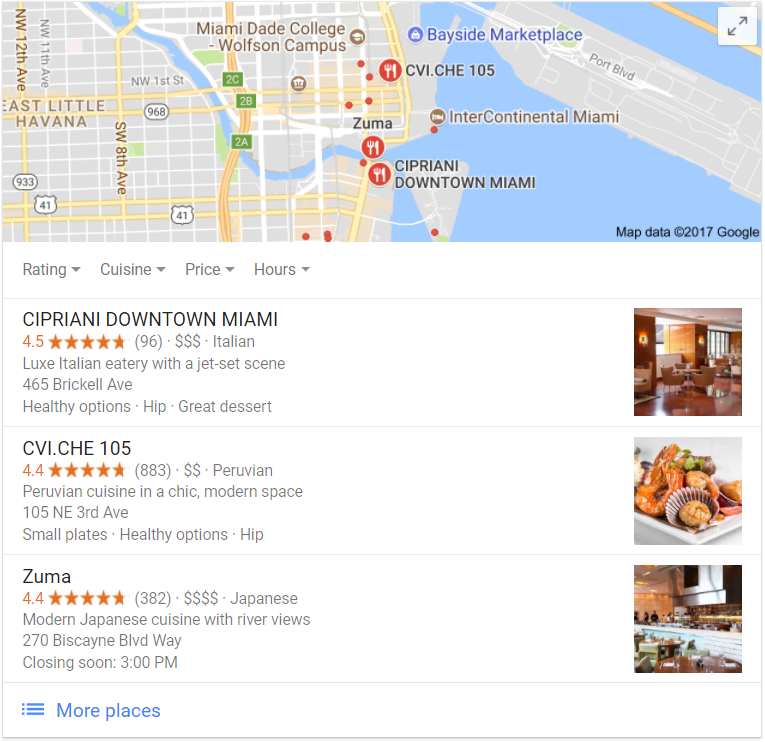 Google My Business listings, like these for restaurants in Miami, FL, appear in the local search results when people conduct online searches. These listings also appear when browsers search for terms like “auto loan” or “savings account near me.” Google determines which credit union branches to show local searchers by weighing a combination of factors, including distance from the searcher, relevance of the branch to the term, and the prominence of the branch. To optimize your listings, create a Google My Business account (if you don’t have one already) and claim each of your individual branches. Then, verify each location and add as much current data as possible. Add things like photos and the operating hours of the location. If you’ve already done this, check regularly to ensure listings are accurate. Google sometimes changes info for a location based on signals it gets from other sources. This can cause inaccuracies. Local listings, sometimes called “citations,” are mentions of branch names and addresses on other web pages, even if there isn’t a link directing to the branch or credit union's website. For the purposes of local search, the most popular and important local listing sites are those like Yelp and YellowPages.com, although there are range of sites with varying degrees of impact on local search rankings for branches. To improve your local search rankings, ensure there is accuracy and consistency across the web. The NAP — SEO jargon for name, address, and phone number — for your branches shouldn’t deviate from one site to the next. Every time it does, especially on the major sites, it’s a hit to your credit union's local search rankings. With so many local listings across the web, a tool like Callahan’s newly released CUBrandMonitor is a great resource. It monitors local listings and alerts you to updates you need to make. Learn more today. Google and other major search engines consider links that direct to your site as a type of endorsement. The more links you have going to your site from trusted websites, the more important it considers your business. For local search, it’s key to have individual pages for each of your branches that other sites can link to. Aside from helping with local SEO, it just makes sense for potential members. When someone finds one of your branches on Yelp and clicks through to see your website, they want relevant information about that branch and not the entire credit union. Sure, creating individual pages might sound daunting, but they are critical to supplying potential members the information they need. Aside from placing the links to your branch pages on directory sites, you’ll want to entice local sources to link to your branch pages. For example, sponsoring an event at a branch is a good way to get links from the event website to the branch website. Or, enter a branch into a local award program to get recognition for the credit union as well as links from the award site. Reviews influence local search rankings in much the same way they influence the opinion of potential members. More reviews, with credit union responses, and higher average rankings make potential members think more highly of a credit union’s branch location. These things make search engines rank a branch higher, too. That’s why it’s necessary to stay on top of reviews across all the major sites. Respond to all reviews — not just the negative ones — to let the search engines know your branches are actively engaging members. Of course, keeping track of reviews for all your branches can be a daunting task. That’s why tools like CUBrandMonitor, which allows users to monitor reviews for an entire branch network under one platform, can be a huge time-saver. The shift in how potential members search for services online makes local search important. The days of users searching via desktop computer and scrolling through pages of search results are over. Today, more people are searching on mobile devices. To help users find services on-the-go, credit unions will have to shift their thinking to serve the needs of users in this condensed environment. Can Browsers Find Your Branches? Contact Callahan & Associates to learn more about harnessing the power of local search with CUBrandMonitor. CUBrandMonitor lets you track your branches’ rankings across search engines in one place. Plus, it helps you manage key areas impacting these rankings like local listings and online reviews. See for yourself during a free online brand audit. One thing I would add is that now Google My Business has the ability for you to show posts for local brand searches. These posts are shown when people in your area search for your credit union by name, and they stay up for 7 days. Since utilizing the posts each week, and getting engagement from it as well, we've seen a boost in our local search rankings as well. Great post!